1) The Prosecution has proven an international armed conflict in Bosnia and Herzegovina no less than five times. This proves that there was no civil war in Bosnia-Herzegovina as previously thought, but a full blown international attack on Bosnia-Herzegovina by neighbouring Serbia. 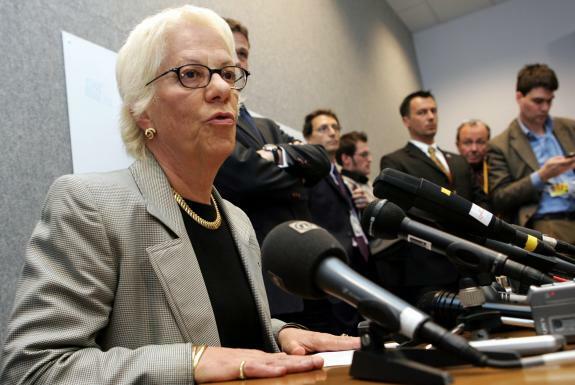 2) An amendment to the Rules was adopted that would allow a Trial Chamber to direct the Prosecutor to cut counts in an indictment, which Mrs. Del Ponte justly refuses to do. 3) Serbia has the main responsibility to locate, arrest and transfer all six fugitives. The co-operation provided by Serbia to the ICTY has been and remains very difficult and frustrating. Thank you very much for giving me the opportunity to provide you with my assessment of the progress made in the completion strategy and to highlight the problems we continue to face. A written assessment was delivered already, and I intend to focus on the main issues. A number of steps were taken internally to increase the efficiency of the Tribunal, while maintaining the highest standards expected from an international court created by the United Nations. In this regard, I have proposed to join cases with a similar crime base. I have filed four motions for that purpose, and three were accepted by the Chambers. One trial with six accused has already begun. Later this year, a consolidated trial with nine accused charged with crimes committed in Srebrenica will start, as well as another one with six leading political and military figures indicted for crimes committed by Serbian forces in Kosovo. My second initiative has been to propose the transfer of cases involving mid-and lower-level perpetrators. This undertaking was met with strong opposition from some victims’ groups. However, my assessment of the local judiciaries is that they are now capable of trying such cases. Beginning in September 2004, I have therefore filed 13 motions requesting the transfer of cases to the domestic jurisdictions of the former Yugoslavia. There is no other case at the ICTY that could be transferred to the region, as, according to the criteria set by the Council, they all concern the most senior leaders responsible for the most serious crimes. Thirdly, I have been working with the Judges in taking all possible measures to ensure that the Tribunal’s own process is as efficient as possible. I have put forward packages of reforms that, if implemented, would significantly accelerate the pre-trial and trial proceedings. Given the seriousness of the cases at the ICTY, it is essential to improve urgently pre-trial management, so that issues are narrowed before the trial starts so that the trial can focus on truly contested matters. Decisions on key issues must be made long before the beginning of the trial. For instance, it is important that a decision be rendered very soon on a motion regarding the disclosure of materials in electronic or hard copy that I filed in the Šešelj case over two years ago. I have also proposed that a much more dynamic approach be taken on adjudicated facts. Such facts have been proven in previous trials, and the Chambers have the power to decide that they must not be proven again in a given trial. The instrument of the adjudicated facts is therefore a key tool to reduce the scope of the trials. For instance, the Prosecution has proven an international armed conflict in Bosnia and Herzegovina no less than five times, wasting months and months on proving the same facts, sometimes with the same witnesses, in case after case. We have to prove it again, for the sixth time, in the on-going Prlić et al. trial. I have also taken the lead in promoting the efficient use of time at trial. For example, in the Prlić et al. case, the Prosecution has put forward a 10 point plan to streamline the trial, within the time limit set by the President of the Trial Chamber, for the Prosecution and Defence respectively to present their cases and cross-examination. This plan was accepted by the Trial Chamber and its implementation does have serious positive effects. During the Judges’ Plenary on 30 May, an amendment to the Rules was unfortunately adopted that would allow a Trial Chamber to direct the Prosecutor to cut counts in an indictment. In view of the checks and balances contained in the Statute, and particularly the duties and responsibilities of the Prosecutor under the Statute, such directions by the Chambers can only be interpreted as purely advisory in nature. Only the Security Council has the power to modify the ICTY Statute, which guarantees the independence of the Prosecutor and assigns to her the responsibility of determining which charges to bring in a prosecution. I am continuously reviewing our cases and I will not hesitate to cut counts when there are clear judicial reasons for that. It is however impossible to arbitrarily cut and slice cases, which are complex by their very nature. My mandate, given by the Security Council, is to prosecute the most senior officials, that is to say persons who were most often far removed from the crime scenes and whose responsibility can only be established by examining a number of different crimes, often in different geographical areas. Removing one or several counts artificially may seriously undermine the prosecution case. Eventually it leads to impunity for certain crimes and does not do justice to the victims, who are already puzzled by the Completion Strategy. Allow me to use an example: Srebrenica. Which counts should I eliminate? Those referring to the killings of over 7,000 men and boys? (see: preliminary list of 8,106 Srebrenica massacre victims) Or those relating to the forcible transfer of 25,000 women, children and elderly people? This would mean that I am only presenting half the picture of the serious crimes that took place in Srebrenica. How can I justify presenting only half the picture of the brutal crimes that took place in the former Yugoslavia? These are choices that, as a Prosecutor representing also the victims, I am not ready to make. This would introduce unacceptable disparity in the treatment of the persons accused by the Tribunal. There must be no justice à la carte. I will again urge the other organs of the Tribunal to focus on the proposals made by the Judges’s Working Group and by my Office. These measures, if fully implemented, would have a serious impact on the length of the proceedings and put the Tribunal closer to realizing the Completion Strategy. Speeding up the proceedings is a top priority of my Office. Obtaining the arrest and transfer of the remaining indictees at large is another one. It has been said a thousand times: it is inconceivable that the ICTY closes its doors with Radovan Karadzic and Ratko Mladić at large. I want to stress again before the Council that impunity for these two most serious architects of the crimes committed in Bosnia and Herzegovina, both accused of genocide, would represent a terrible blow not only to the success or failure of the Tribunal, but to the future of international justice as a whole. Serbia has the main responsibility to locate, arrest and transfer all six fugitives. According to my information, Mladić, Tolimir, Hadžić and Župljanin are in Serbia. Furthermore, there are established leads connecting Serbia to Karadžić, whose location is unknown, and to Ðjorđevic, who is still believed to be in Russia. The fact that Mladić has been an active officer of the Army of Yugoslavia till May 2002, one year and a half after the fall of Milosević and seven years after he was indicted, adds to the responsibility of Belgrade for its failure to deliver the former General. Over the past twelve months, the Serbian authorities have repeatedly promised that Mladić would be delivered soon. I was told regularly by Serbian officials that the circle was closing down around him. At the end of April, in view of Serbia’s failure to achieve the promised results, I re-assessed the whole operation and found out that it had been suffering grave defects. During 2005, there was no real attempt to locate and arrest Mladić. Time was wasted in trying to encourage him to surrender voluntarily. Since the beginning of this year, it seems that more was undertaken. In particular, his support network was targeted, and several of his supporters arrested. These actions were sometimes spectacular, they fed many news articles, but they lacked the necessary discretion that would have allowed to acquire information leading to Mladić. The most blatant dysfunction is the total lack of co-operation between the military and the civilian authorities. The inconsistencies I could identify in the various reports provided to me came as another surprise and forced me to suspect that some of the information contained in these reports had been doctored for political reasons. In our co-operation with Belgrade, we have not managed to achieve so far the level of trust and transparency that we had achieved with other countries. I will keep on engaging the Serbian Government in the months to come, trying to establish more confidence and a better communication. As to the other aspects of the co-operation with Belgrade, a mission was sent in the second half of May to test the new arrangement agreed upon with the Government of Serbia and Montenegro regarding access to archives. This has been a long standing problem. The first accounts I received from my staff are encouraging. To sum up, the co-operation provided by Serbia to the ICTY has been and remains very difficult and frustrating. There is serious political and administrative resistance within the system, and a strong political will is needed to overcome those obstacles. On the basis of the facts in my possession, I cannot be convinced that Serbia is ready to arrest Mladić. For a number of reasons, the authorities may still prefer to force him to surrender voluntarily. Republika Srpska within Bosnia and Herzegovina also has to increase substantially its efforts to locate and arrest fugitives. Whereas it is unclear whether Radovan Karadžić still resides at times or travels through Republika Srpska, it is certain that part of his network and of his family remains there. In the reporting period, the cooperation provided by Republika Srpska to my office has rather decreased, which is due to political reasons and the reshuffling of personnel in the police. Now that a new team is in place, the search for Karadžić must intensify rapidly. My office has maintained a positive working relationship with Montenegro for over a year, and I expect this co-operation to continue at full speed. Part of Karadžić’s family is living in Montenegro, and he can count on numerous supporters there. I am particularly disappointed about the lack of movement on another important fugitive, Vlastimir Ðjorđevic. The investigation carried out by the Russian authorities, as they told us, has failed to produce results. This will have negative implications on the completion strategy, because, if Ðjorđevic is not surrendered within the next weeks, it will be impossible to try him with his six co-accused. Resources will therefore have to be wasted in a separate trial. Ðjorđevic is accused of very serious crimes committed by Serbian forces in Kosovo. The long and unexplained delays in the transfer of Zelenović, who was detained in Russia since August 2005, do not allow for optimism in the future of the ICTY’s co-operation with the Russian Federation. It is also worrying that a sister organisation of the Tribunal, the UN Mission in Kosovo, refuses to co-operate fully with the Tribunal. My office has nowadays more difficulties to access documents belonging to UNMIK than in any other place in the former Yugoslavia. Furthermore, the UNMIK leadership is encouraging a climate which deters witnesses from talking to my investigators when it comes to the Albanian perpetrators. Very recently, there have been some indications that the UNMIK is willing to take a more constructive attitude in its relations with my office. I explained at length in my last report why Karadžić and Mladić are still at large more than 10 years after they were first indicted. My assessment remains the same today. Serbia has to do much more to arrest and transfer Ratko Mladić. The arrest of Radovan Karadžić is a shared responsibility of Serbia, Republika Srpska, NATO and EUFOR. It is pathetic that today, nobody is searching actively for Karadžić. The planned downsizing of EUFOR will further aggravate the situation. Since no one else seems to have the political will to locate and arrest Karadzic and Mladić, I will have no choice but to seek from the Council the powers to arrest fugitives where ever they are and to allocate to my Office the necessary resources for this. Ultimately, I do not see any other way for the ICTY to fulfil its mandate and satisfy the legitimate expectations the victims placed into the United Nations.